Matthew 13:1-9. Pause. Look. Listen. Let the parable take you where it will. As the Sunday Morning Forum at St. Margaret’s Episcopal Church prepares to meet, Hovak Najarian and Kathleen Kelly shared observations, poetry, and questions to lead into the Gospel parable (Matthew 13:1-9, 18-23) and to inspire your learning. 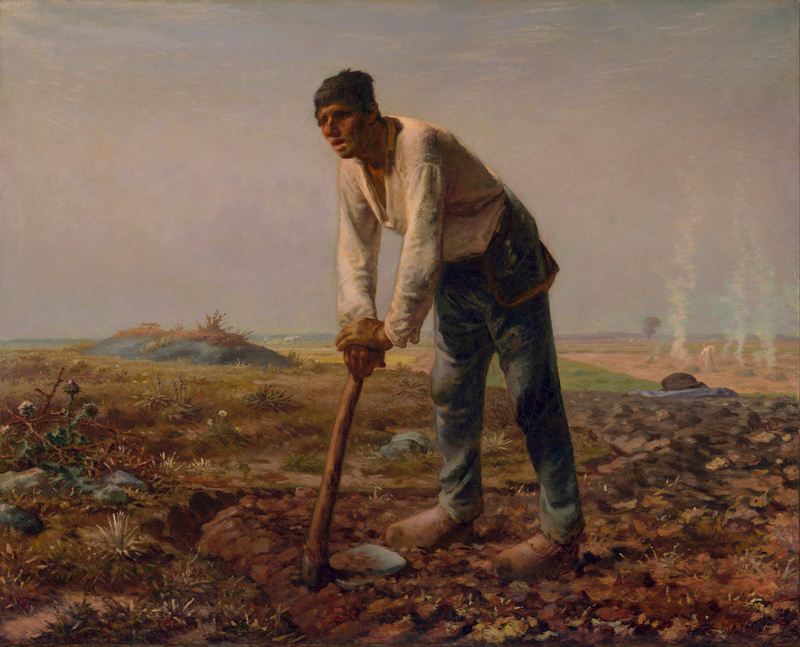 Sunday’s Gospel gives us the parable of the sower and Jean Francois Millet’s painting,The Sower, came to mind immediately. This popular painting has been reproduced many times and it is likely you are familiar with it. [it is available on T-shirts.] There is a great deal that could be written about Millet’s Sower, but the focus of Christ’s parable was on what happens when seeds fall onto various surfaces … the message is not about the sower himself. From, The Sower, my mind shifted to Millet’s, The Man With The Hoe, and a poem by Edwin Markham. Instead of writing a commentary this week, I would like to share this painting and poem with you. It is not related to either of the readings for Sunday but the painting is worth seeing and the poem worth reading. In one sense, it could be said that the parable IS about the sower — a farmer who is willing to “squander” seed by tossing it in all directions (without regard for the conditions) as though there is no limit to the abundance of this resource.